The structure indicated is the inferior sagittal sinus. The brain is drained by a series of veins and venous channels which drain into large dural venous sinuses, which in turn ultimately drain to the internal jugular veins. 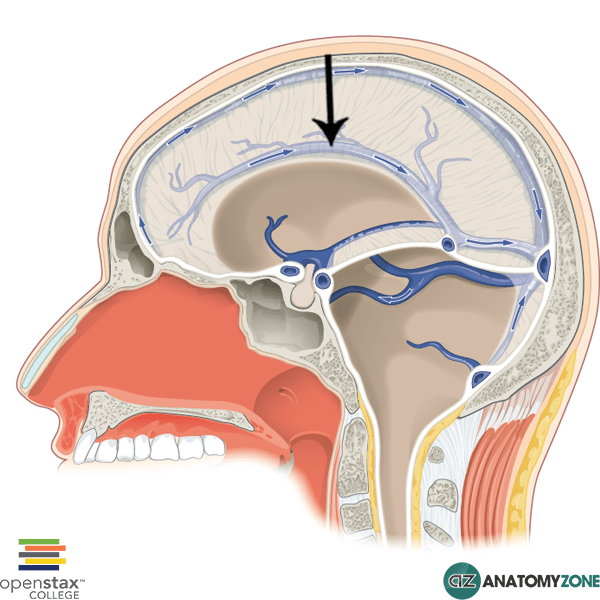 The dural venous sinuses are lined by endothelium and located between the layers of the dura mater in the brain. The venous sinuses are different to other blood vessels as they do not have the same set of layers which form their walls, and do not contain valves, like veins. In addition to the venous sinuses, there are deep veins and superficial veins. Veins draining the structures of the basal forebrain (thalamostriate and choroid veins) unite to form the internal cerebral veins. The internal cerebral veins then unite to form the great cerebral vein (vein of Galen) which drains into the straight sinus. The inferior sagittal sinus runs along the inferior border of the falx cerebri, above the corpus calosum and drains to the straight sinus.